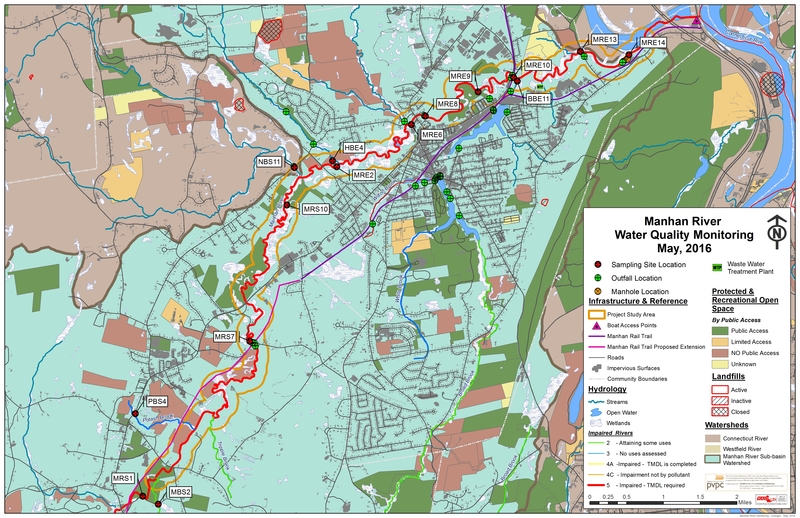 The stretch of the Manhan River between the Tighe Carmody Reservoir and the Connecticut River is listed in the 2014 Massachusetts Integrated List of Impaired Waters as a Category 5 waterway impaired for E. coli contamination. The Manhan River is also a Class B water, designated as habitat for fish, aquatic life, and wildlife as well as primary and secondary recreation. 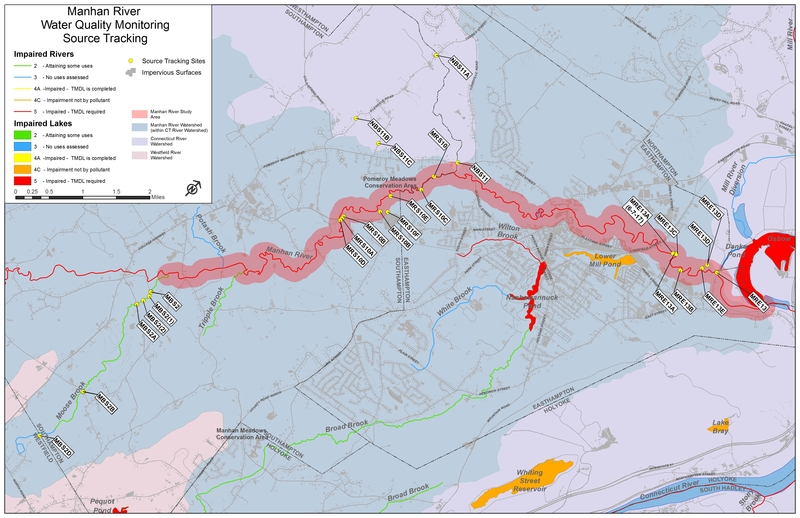 The lower 6.2 miles, which run through the City of Easthampton, are listed as not supporting primary recreational uses due to E. coli contamination. In prior years there was not a clear understanding about the individual factors that may be contributing to the E. coli impairment. MassDEP’s 2003 study noted that sources of potential contamination were unknown, and recommended further examination upstream. Previous assessments for illicit discharges in Easthampton by the City (2001) did not test for pathogens, but many of the illicit discharge and cross-connection issues that were found – which may have been possible sources for E. coli contamination – were resolved. Prior to this project, upriver land uses have never been thoroughly investigated as potential sources of E. coli contamination. The study entailed collecting grab samples during 3 dry and 3 wet weather events. Wet weather for this study was considered >0.1” of rain within the preceding 24 hours. This shorter time frame (as opposed to > 0.25 in 48 hours or >.5 in 72 hours) was intended to capture the more immediate impacts of stormwater flowing off nearby surfaces into local streams and outfalls into the river. Sampling for the 3 dry and 3 wet weather events occurred between July 12 and September 20, 2016, with a trained crew of nine volunteers. Volunteers collected river water samples to be analyzed for E. coli, surfactant, and ammonia (NH3). Volunteers also obtained air and water temperatures and recorded observations at each sampling site on field data sheets, including flow, odor, water color, signs of wildlife, and any other noteworthy observations during the time of sampling. Once the regular sampling events sampling were completed, PVPC staff examined results and prioritized those locations showing the greatest frequency of elevated E. coli levels not associated with anthropogenic sources in both wet and dry events. Sites showing elevated levels of E. coli without corresponding elevated ammonia and surfactant levels were prioritized. PVPC prepared working maps of sub-watershed areas to begin identifying best locations for source tracking relative to locations with elevated E. coli results. Source tracking strategy was further informed by discussions with city and town officials. Based on this analysis, PVPC chose to source track above four sampling locations: Moose Brook in Southampton (MBS2), Whittemore Conservation Area in Southampton (MRS10),N. Branch (Manhan River) in Southampton (NBS11), and Ft. Hill Road in Easthampton (MRE13). PVPC conducted multiple rounds of source tracking to identify the sources of E. coli to the extent possible. It should be noted that Potash Brook (PBS4) also showed consistent elevated levels of E. coli during dry and wet events, but it was not chosen for source tracking due to access issues. Due to the very dry summer of 2016, regular sampling was not completed until late September 2016. Therefore, source tracking was postponed until the summer of 2017. Locations identified through source tracking as persistent problem E. coli areas were flagged as priority project locations for stakeholder outreach and education, and implementation of best management practices. Decreased runoff will reduce the rate of erosion as well as the movement of sediment and dissolved and sediment-attached substances to downstream watercourses. To examine the possibility of Best Management Practices (BMPs) in addressing E. coli inputs at priority locations related to the Manhan River, PVPC solicited quotes from 13 qualified vendors identified through the Massachusetts Supplier Diversity Office, and received one response from a qualified vendor. PVPC used project funding to hire Shannon Rice-Nichols. The consultant met with PVPC and municipal officials to review results and then conducted site visits in February and March, 2018. The consultant analysis entailed a review of water quality results, information on existing drainage, soil infiltration characteristics, flood zones, and wetlands. She also reviewed land use, ownership, and conducted resource evaluations to identify sites where appropriate BMPs could be proposed. The consultant developed a summary of BMPs to reduce bacteria loading into the Manhan River and tributaries and talked with residents and town and city officials about preferred options. All solutions proposed were designed to be non-destructive to farm land, and not disruptive or discouraging for local land owners, but rather oriented towards achievable and implementable solutions. A number of agricultural Best Management Practices, or BMPs, have been demonstrated effective in reducing or minimizing water quality impacts, as part of an overall watershed approach. Given site conditions and resources of concern identified through the project investigation, conservation buffers, grazing management, Animal Feeding Operations (AFOs) Management, and Erosion and Sediment Control practices were selected for voluntary implementation by land owners in teh project area. While the majority of the findings from this investigating point towards agricultural and livestock land uses, it is important to keep in mind the increased development pressure currently placed on useable parcels along the Manhan and its tributaries in both Easthampton and Southampton. As historically agricultural use parcels are converted to residential and commercial uses, these communities should ensure that developers employ LID principles/techniques to reduce the negative impacts to water quality. Throughout the course of the project, Pioneer Valley Planning Commission promoted its partnership and provided updates on the project through various media. There were also several specific events associated with this project to broaden the scope of outreach and education surrounding issues of water quality and agricultural BMPs for stormwater in the Manhan River Watershed. The opportunity provided through this project offered an enhanced awareness to local residents and local officials of the Manhan River’s ongoing impairment in Easthampton. The inclusion of Southampton sites also allowed the opportunity for residents and stakeholders to consider that E. coli contamination is not necessarily a problem only found in urban areas. Assisting with sampling also allowed local residents a direct way to engage with the Manhan River. On July 7, 2016, PVPC held an event at the Easthampton Municipal Building to talk about the Manhan River, project objectives, and train interested volunteers to collect samples for the 3 dry/3 wet weather events. EASTHAMPTON---Volunteers are sought to monitor water quality in the Manhan River between July and September of this year.